This third-grade narrative paragraph contains many sensory details and interesting ideas. One night last week, we had a thunderstorm! Lightning cracked the black sky. Thunder shook the windows. The rain fell so hard on the desert that the sand was splashing up like little fountains everywhere. We heard a crying sound. It sounded like a sheep going "bah" but they don't live in Oro Valley. Mom looked out the sliding door. On the wall sat a Colorado River toad. It bleated over and over. Mom said it was happy for the rain. Thunderstorm! by Thoughtful Learning is licensed under a Creative Commons Attribution-NonCommercial-ShareAlike 4.0 International License. 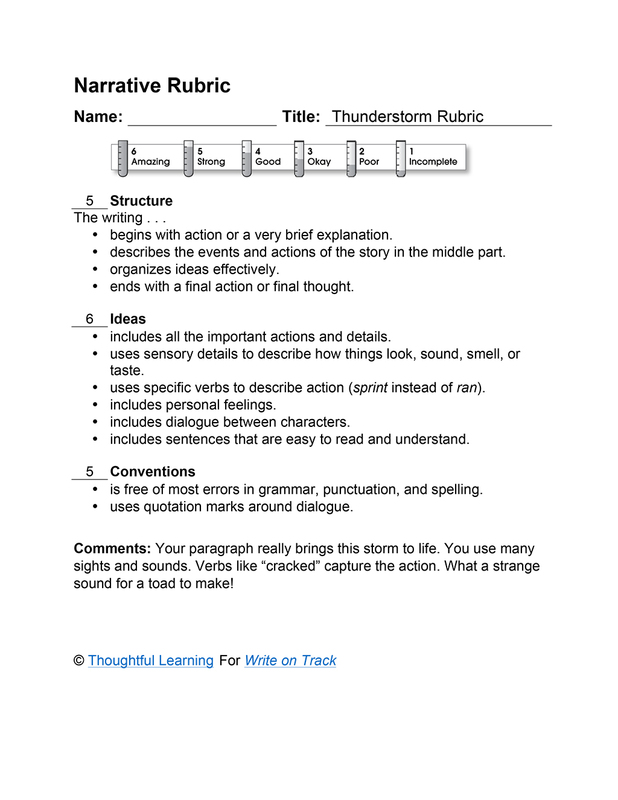 Based on a work at k12.thoughtfullearning.com/assessmentmodels/thunderstorm.